Soundness Test on Cement is carried out to detect the presence of uncombined lime in cement. This test is performed with the help of Le Chatelier apparatus as shown in figure below. It consists of a brass mould of diameter 30 mm and height 30 mm. 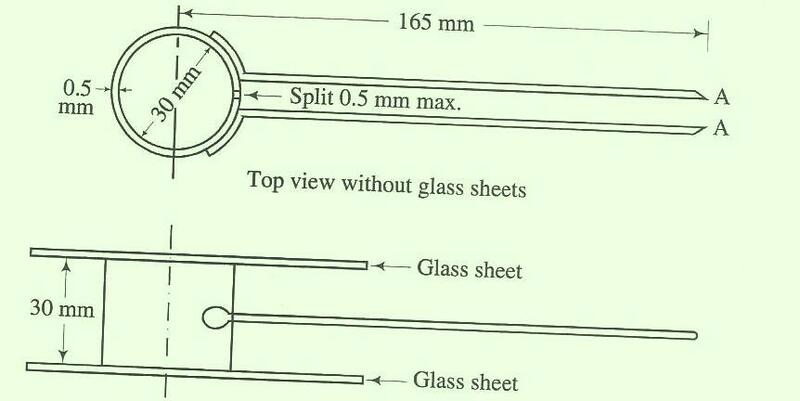 There is a split in mould and it does not exceed 0.50 mm. On either side of split, there are two indicators with pointed ends. The thickness of mould cylinder is 0.50 mm. (i) The cement paste is prepared. The percentage of water is taken as determined in the Consistency test. (ii) The mould is placed on a glass plate and it is filled by cement paste. (iii) It is covered at top by another glass plate. A small weight is placed at top and the whole assembly is submerged in water for 24 hours. The temperature of water should be between 24°C to 35°C. (iv) The distance between the points of indicator is noted. The mould is again placed in water and heat is applied in such a way that boiling point of water is reached in about 30 minutes. The boiling of water is continued for one hour. (v) The mould is removed from water and it is allowed to cool down. (vi) The distance between the points of indicator is again measured. The difference between the two readings indicates the expansion of cement and it should not exceed 10 mm.